Thomas Alva Edison held 1,093 patents for different inventions. Many of them, like the lightbulb, the phonograph, and the motion picture camera, were brilliant creations that have a huge influence on our everyday life. However, not everything he created was a success; he also had many failures. He also did not find the successful inventions with his first experiment. In his question to create the storage battery, he conducted 10,000 experiments before arriving at a method that worked. 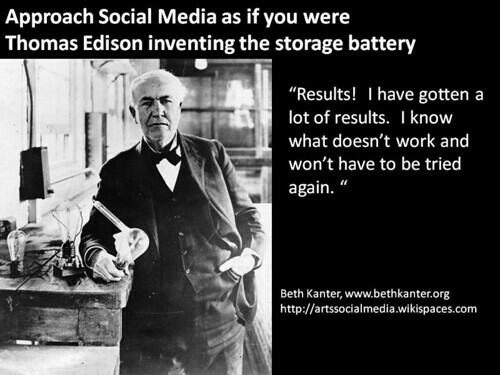 You have to be like Thomas Edison in approaching social media and experiment. It isn’t whether your experiment is an immediate success, it is more about what you learn about what works and what doesn’t. If you want to be successful using social media, you have to take this approach. The problem I see all too often is that many nonprofits expect immediate success and at the first “failure” they quit. So, I designed a training curriculum that embraces thoughtful do-it-yourself social media experiments and a process for learning from them. 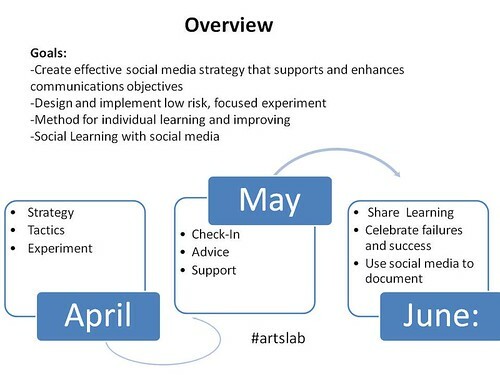 On Friday, I facilitated the final face-to-face workshop for the Social Media Lab for 25 arts organizations inspired by Thomas Edison’s approach. It was sponsored by the Hewlett Foundation, Wallace Foundation, San Francisco Foundation, Grants for the Arts, and the Koret Foundation. The whole idea got started a year ago when James Leventhal who is Deputy Director for the Contemporary Jewish Museum asked me if I would design some trainings for the local arts community. James assembled a group of funders and the talented Clay Lord from Theatre Bay Area, a local arts service organization to help implement project. And, then they asked me to design something … I agreed as long as we all went into it with the mantra – it’s an experiment, not every social media experiment (and capacity building program for that matter) is a success for all participants – some might bomb. They agreed. The inspiration was part The Lab Theater a place where you try out contemporary or experimental works before you bring them to the main stage and part peer learning program. The content for the first face-to-face sessions was based on the workshops I’ve been leading for the past five years and includes the Social Media Game, Strategy Principles, Experimentation, and the practical and tactical. 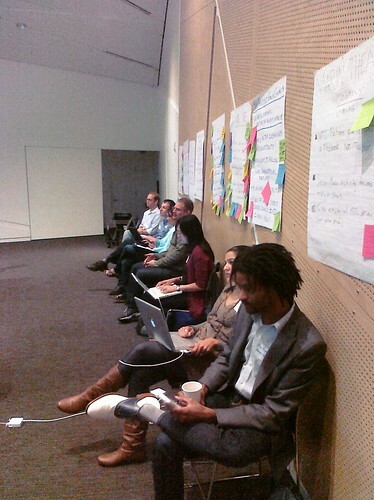 After the first session, participants had to design a small, low risk experiment. 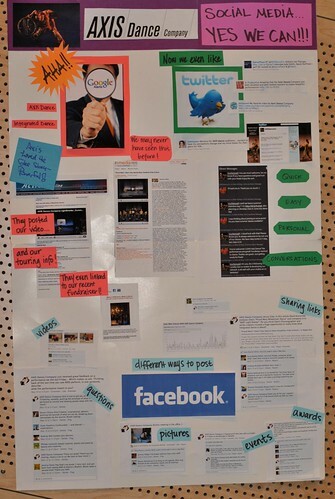 But more importantly, they had to get their hands dirty with social media. I provided participants with templates, checklists, and tip sheets to pick and implement an experiment during the 8 weeks between sessions. We also had regular conference calls where we discussed progress and offered support. Not everyone’s experiment showed breath taking results in the beginning, middle, and even towards the end of the two months. Some participants got frustrated along the way, but part of the learning was to make time and space for reflection to get to deeper insights and improve practice. And, with the regular conference calls we started to see a transformation. From skepticism and feeling overwhelmed, to deeper learning about what works with their social media strategies. And lots of peer support and connections. My role changed from the “expert” to guide on the side. -What were the objectives, audience, and how did integrate with your marketing or audience development plan? -What were some tactics that you tried? ­-If you could do this experiment all over again, what would you do differently? 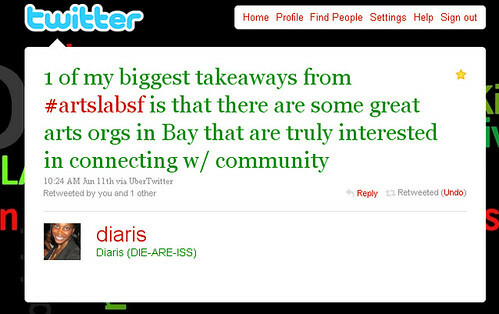 -What was your big ah ha or insight that you’ll use in your next social media strategy? In a couple of presentations, we heard some insights about participants being “fortress fighters” from within. As one participant said during her presentation, “The rest of the staff at our organization is like our audience in some ways. They don’t like the Internet, they don’t even like electricity. We’re doing social media because we’re facile with it, but it takes patience to introduce to the rest our staff and have it become a part of our culture.” This opened up a great peer discussion, completed with great advice, and peer support. In our book, The Networked Nonprofit, we feel that charities need to thoroughly embrace social media (and the new leadership behavior their use requires). But this is happening. If nonprofit wait too long, I suspect these organizations will not thrive and some may not survive in the decade. Change needs to happen now or organizations risk playing a game of catch up. The SF Gay Men’s Chorus shared their journey from skepticism about social media, to dipping in their toes into listening (and finding it overwhelming), and to getting past that to finding a lot of value. Some of the presentations focused on the tactics. Here I saw a deepening of understanding and practice. 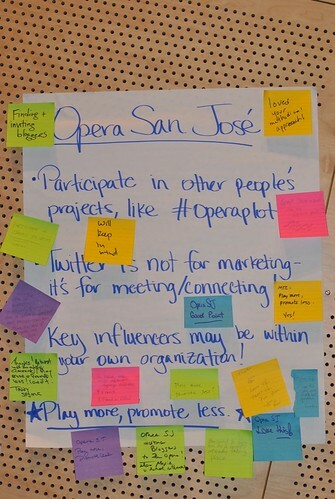 Opera San Jose gave a presentation on its #operaplot hashtag contest where participants has to tweet the plots of operas in 140 characters. They discovered a group of influencers won Twitter who were passionate fans of the company and have since enlisted them to spread the word. The Contemporary Jewish Museum shared some learnings from their listening experiment which has helped them connect and cross promote the work of other art museums and Jewish organizations in the Bay Area. 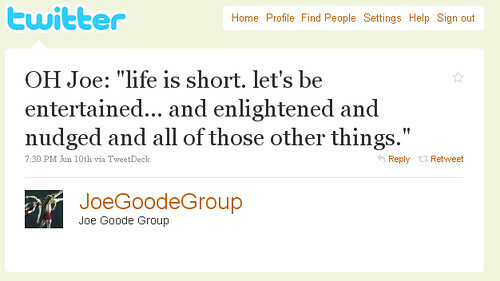 The Joe Goode Dance Company spoke about the challenges of getting an artistic director to Tweet. One of the things they discovered is that their audience wants to hear from the artists. But not all the artists are comfortable on Twitter. So they used the technique of “OH” or overheard. The participants in the room offered lots and lots tips and advice on how to overcome this problem. Participants were given an option of how they wanted to deliver the presenters, either as full group “ignite” style presentation or in small groups using the “speed geek” style. This enabled participants to select a delivery method that was most comfortable to them. 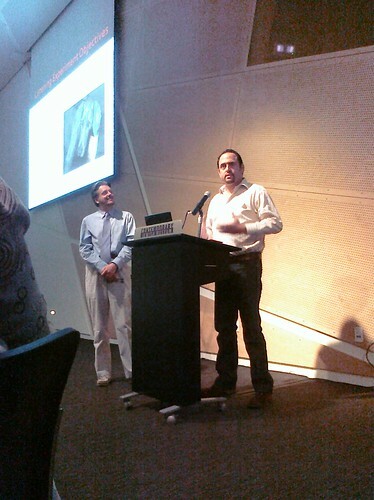 It also allowed for a lot of cross pollination of ideas and insight generation. Participants were very creative in their presentations, not surprising given this was a group of arts people. For example, the Bay Area Children’s Theatre gave their report in the style of a children’s story. Social media takes time and effort, but doesn’t have to take all of our time. We can be efficient, but need to be as strategic as possible. Need to involve staff, board, and artistic directors in the social media strategy that it isn’t overwhelming for them. Social media, at least in the early stages of experimentation, can power audience development and understanding of the art form. Social media is a great way to connect with peers, learn from them, and work together in promoting our work. Trainings that involved “action learning” together can be a powerful way to build social media capacity. Being effective with social media strategy requires approaches it like Thomas Edison – as an experiment. Many times, nonprofits avoid an experimental approach because of being afraid to fail, not celebrating the learning and insights that can result. How do you create a culture that values social media experiments and learning to get at tangible results? Thanks Beth. Not fearing failure, but actually counting on it, is something I think we all need to embrace. One tactic I have heard of that makes sense is to conduct your initial experiments in sort of a “rogue marketer” fashion, under the management radar so that you can learn and show improvement when you do present findings and ask for more resources. What do you think of that practice? It’s funny how often some of our fellow “non-profit leaders” forget that being a “leader” requires leadership — often, putting one foot forward, then the other, and getting other people to follow along even if they’re not sure about taking those steps themselves. If it’s right for your organization — if it furthers your mission — then its your responsibility to push it forward.